Wipe's going to be soon...anyone else playing? Faker is very active in it. I think Bl4ck and Geoff play from time to time. It's the next best thing after squad in my opinion. You gotta practise and also not fear losing your gear. Thats the beauti of it. Get quests done asap to level up ur traders so you can invest in better gear. I have seen a few vids on the Utubes but not played it yet. Is this on steam or is there another loader you have to get for it? Its a very frustrating, punishing and rewarding game at the same time. Each players has his or her playstyle so not all might fit. They have such better gear and stats you get hurt by looking at them. Take your time, get to know the maps and play held back. Sometimes its better to run from a fight then to jump into it. "Today is tomorrow and tomorrow is the past, but the past has yet to come..."
Step 1: load into customs as a scav. Step 2: hide and let the big bois destroy the scav boss and his pose. Step 4: take all thou can carry. 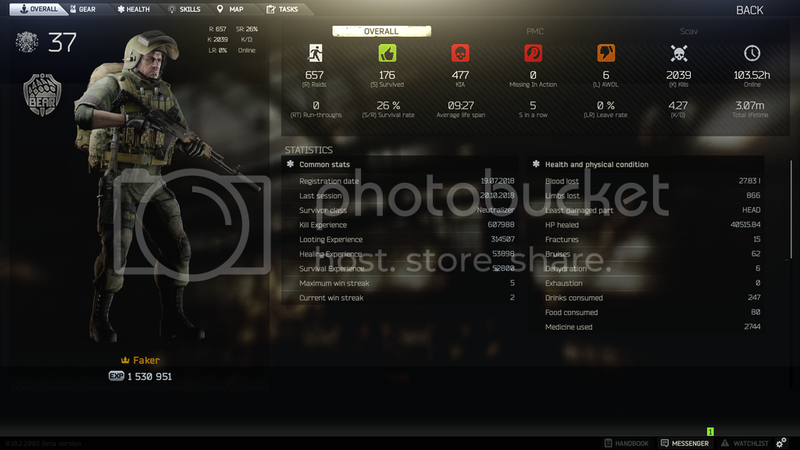 26% Survival Rate - "Welcome to Tarkov"